Royal Wolf, Australasia’s largest shipping container provider, is proud to announce an exciting new partnership with Wests Tigers, one of the country’s most community-minded NRL teams. Designed to positively impact the lives of others, the Wests Tigers Community Program is built on the six key pillars of Education, Indigenous, Multiculturalism, Women, Healthy Living and Grass Roots. Importantly, it also aims to raise awareness of mental health issues. As CEO of Royal Wolf, Mr Neil Littlewood said, “Royal Wolf has an ongoing commitment to making a sustainable difference to the Australian community, particularly to those who are disadvantaged or at risk. The Wests Tigers Community Program is closely aligned with our values and we are delighted to have the opportunity to partner with Wests Tigers in this important initiative.” With over 30 community programs planned throughout the year, the West Tigers Community Program will be used to help deliver a variety of community initiatives and programs. To assist Wests Tigers on-site at these events, Royal Wolf is providing a unique activation space – the specially branded ‘Royal Wolf Community Container’. As Mr Littlewood explained, “The Royal Wolf Community Container will support the Wests Tigers’ initiatives at many key events such as the NRL’s Indigenous and Well Being rounds as well as the ‘Tigerize your Classroom’ program. “As one of Australia’s most popular NRL teams, Wests Tigers is in a position to take advantage of its profile to enhance the lives of others. We commend them for this worthy initiative and look forward to the delivery of real and tangible benefits for the community.” Wests Tigers Fan Engagement and Community Manager Shaun Spence welcomed Royal Wolf on board at the Club. 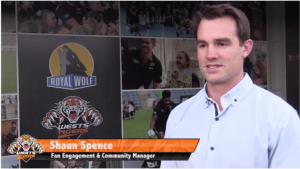 “It’s great to have an organisation such as Royal Wolf partnering with the Club and allowing us to better deliver our community programs,” said Spence. “Our community programs are incredibly important to the Club and we’re continuing to build meaningful partnership with those that we work with in this area.” “I look forward to growing the partnership with Royal Wolf over the coming years,” he said.